Janet Erimie opened her first transaction with Quality Timeshare Closings in April of 2005, co-brokering with one of our regular agent clients, and we have been working together regularly ever since. A 14 year resident of Florida, she has been in the timeshare business for 30 years total, the last 13 in resales. According to Janet, “I was approached on the beach in Cancun, Mexico by an OPC who asked me to come to work with her once she found out I was living there. So I starting with inviting guests to presentations and moved up to sales from there”. Prior to that, Janet had worked in Cleveland, Ohio in the Hotel industry starting as a reservationist and working her way up to a Catering Manager position for a major hotel. “I previously worked for 12 years for Fidelity Real Estate and started as an agent and moved up to office manager to sales manager. Of course being a larger company we sold thousands of timeshares over that 12 years. I opened my own business in February of 2013. We sold from February – December 31st about 215 transactions and for 2014 have over 150 transactions at this time”, Janet shared with us. Janet sells just about any timeshare property, but specializes in Marriott, both Legacy weeks and Destination points, Westin and Aruba properties. 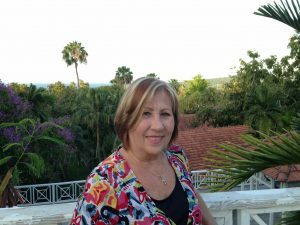 She is a member of LTRBA, the Licensed Timeshare Resale Brokers Association, which is a reliable website to find a legitimate timeshare resale sales person as opposed to the dishonest scammer types that pop up out there every day. Members are thoroughly screened and accountable. Janet loves music, travel and animals and tennis events. She owns 2 weeks of timeshare at Sandals Grande in Ocho Rios Jamaica. Her husband is also a licensed broker and works in the timeshare industry. He is a tennis professional and instructor licensed with the PTR and has his master diver license with PADI. Our photo is Janet enjoying her most recent stay in Jamaica.